LeoSat Enterprises, which is launching a constellation of up to 108 low-earth-orbit communications satellites, has entered into an agreement with Signalhorn, a leading provider of hybrid network solutions for Enterprise and Government customers worldwide. With the ever-growing demands of managing Big Data and Cybersecurity, global enterprises and governments now, more than ever, need instant infrastructure from anywhere to everywhere which is fast, secure and reliable. 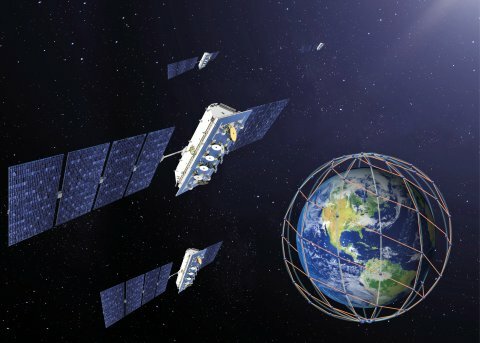 LeoSat’s system of low earth orbit communications satellites can achieve lower latency and stronger end-to-end security compared to traditional satellite and terrestrial solutions used today. This is achieved through an advanced and unique system architecture utilizing optical inter-satellite laser links which connect the satellites, creating fiber-like symmetry at Gigabit speeds while providing total security as the data is encrypted and secured from end-to-end across the network, with no terrestrial touch points. For Enterprise and Government customers, the key attributes of the LeoSat system are ideal for a number of applications, for example, to give banks secured networks with foreign offices, provide significantly more bandwidth for oil & gas exploration than is available today, enable seamless connectivity for shipping & fleet management, or provide primary 4G and 5G satellite backhaul connectivity for cellular operators. LeoSat can also offer competitive advantage in existing network services markets, by expanding these markets from enabling new opportunities through multi-gigabit bi-directional performance, combined with worldwide reach. LeoSat’s Chief Commercial Officer, Ronald van der Breggen, said, “We are often asked if LeoSat is a satellite or a networking company. In fact, we are both and with our laser-connected satellite constellation we will effectively have a network of 78 MPLS ‘routers’ in space, completely covering the earth. In combining satellite and network technology, we have developed a solution that truly realizes the synergies and benefits from both worlds. With Signalhorn taking up to 2 Gbps of capacity, we see this as firm endorsement of our ability to offer new opportunities for networking connectivity”. Michael Biederer, VP Operations & Customer Care of Signalhorn added, “At Signalhorn we believe in doing everything we can to make the network solutions we offer to our customers better. This drive for excellence fuels our choice of products and we are therefore delighted to add LeoSat’s next generation architecture to our existing portfolio of innovative communications solutions. By combining the best of satellite with the attributes of terrestrial networks we see a whole host of new opportunities for our customers”. Signalhorn is a global provider of premium network services and communications solutions using terrestrial, satellite, and wireless technologies, with a 40-year history of continuous operations. The services and solutions encompass end-to-end network design and management and include hosting and housing. Enterprise, oil & gas, government, NGO, and maritime customers all rely on the round-the-clock, responsive services and dependable solutions to support mission-critical operations. With proprietary technical centers in Switzerland and Germany, Signalhorn customers benefit from secure and cost-effective connectivity via dozens of satellites and hundreds of points of presence around the globe.